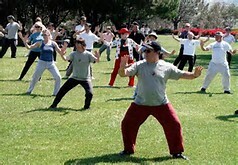 Tai Chi has been reported by The Johns Hopkins Medical letter to relieve stress, improve balance and prevent falls, enhance the quality of sleep, reduce arthritis and back pain, lower blood pressure, and boost immune and cardiovascular function. Instruction includes: Yang Long and Short Forms, Clear 16, Wu Short Form, self-defense applications, cane defense, 8 Brocades Qigong, and Hsing-I. The experience, cultivation, and movement of chi is emphasized. For information and to register, call Dr. Chan any day after 10 a.m., 706-563-3539. Price: $10 per class. Contact: Dr. Chan, 706-563-3539 after 10 a.m.